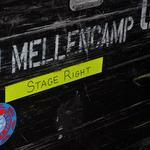 Each ticket purchased for John Mellencamp's February through April 2011 concerts in the U.S. includes an MP3 download of his new album No Better Than This AND a chance for an upgrade to the FRONT ROW! Each download code that is redeemed will give you a chance to be selected for an upgrade to a pair of front row tickets! DOWNLOAD TODAY! Concert attendees will want to hear John's new album in advance of the show so they can fully enjoy John's newest songs when he plays them live! If you have not redeemed your code yet (i.e. it is still waiting for you in the email sent to you by Ticketmaster or another ticketing service), you must go HERE to redeem your code in order to receive your download of No Better Than This and be entered into the Front Row drawings. For EVERY MP3 album download code you redeem you will be entered in a drawing to have a pair of tickets upgraded to the FRONT ROW. This means if you bought multiple tickets, you received multiple download codes and have multiple chances if you redeem all of the albums! Be sure to use all of your codes, share them with the other people going to the show or use them as gifts. The codes make EXCELLENT gifts and are a great way to share John's great new album with your music loving friends! If you purchased 8 tickets and used all 8 No Better Than This download codes you would have 8 chances to be upgraded for a pair of FRONT ROW tickets to your show! Those selected for an upgrade will be contacted several weeks before their show via the email address they ordered their tickets with. Approximately a week after your ticket purchase you will receive an email from your ticket seller including your unique download codes and instructions. Most of these will come from Ticketmaster with the email address of alerts@ticketmaster.com. Others will come from the venue or the ticket seller you purchased your tickets from. The subject on the emails should be Download Instructions - John Mellencamp - No Better Than This. Once you have received your email with your promo download codes do the following. 2. Enter your promo code under the Promotional Code area at the bottom. Then press “Submit”. 3. Choose “Proceed To Checkout” or “Check Out with PayPal” to continue. 4. Complete your checkout and download your album! Inquiries related to your MP3 Download or promo code should be directed to merchandise@musictoday.com. Because we know this process will be new to many of you here are screen shots of each step of the redemption process! Please do not be concerned or overwhelmed. This is a simple process that only takes minutes to complete. If you purchased your tickets from Ticketmaster your Code Email looks like this - note the links to forward your additional download codes to a friend(s). Click on http://www.mellencamp.com/news.html?n_id=1088 news article for the full tutorial.